We know you’ve been patiently waiting, the time has finally arrived and we’re pleased to announce the release of the much anticipated Dark Knight. 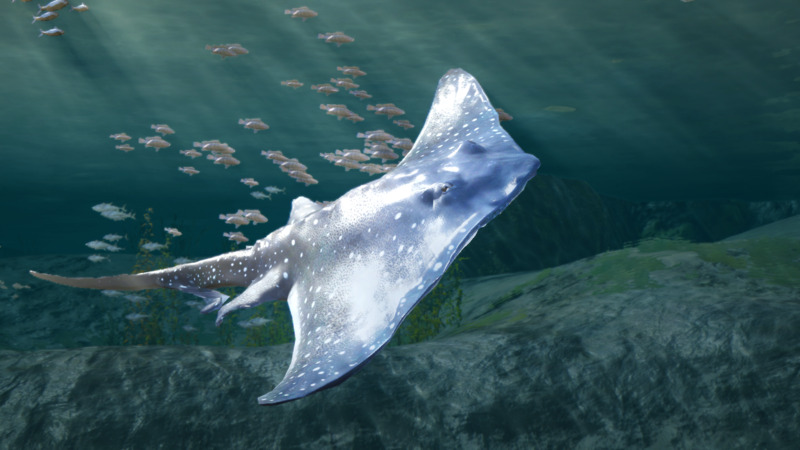 In celebration of welcoming this latest addition to the game we’re introducing a new event! Players can engage in a variety of activities to begin collecting Dark Knight’s Seals, which can be turned into one of two prizes aimed at helping players get started on their new class. Event Requirements: Participate in one of the following activities to have a chance to earn Dark Knight’s Seals: Kill monsters, Perform gathering, or Go fishing. Players can then trade these seals in for one of two rewards. Additional Details: These seals will be removed from player’s inventories during maintenance on April 5th, 2017. 3. One Year Anniversary Field Boss Event! Event Details: To kick off our first anniversary in style we’ll be spawning special event Field Bosses! 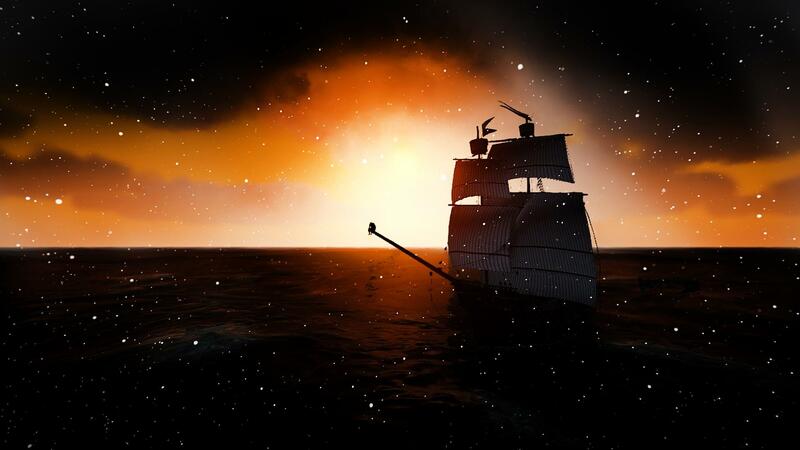 All players who hit the boss at least once will receive the [Event] Field Boss Reward Bundle. We’d like to allow everyone to participate, and as such there is no death penalty should you fall during battle from the boss fight. 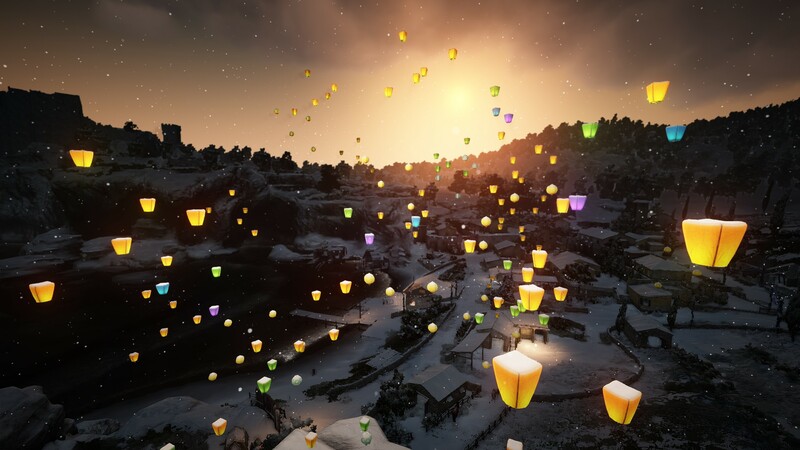 Event Details: In celebration of our one year anniversary of Black Desert Online, players will receive a special furniture item to showcase in their house via the in-game mail system! 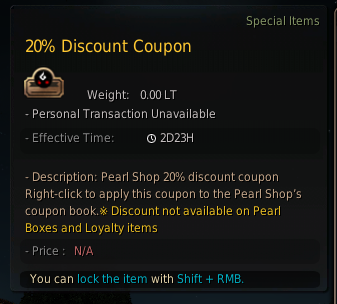 Event Details: Loyal players will receive a single 20% Discount Coupon (x1) via the in-game Coupon Book in the Pearl Shop. This item can be applied to every Pearl Shop category except Pearl Boxes, Shopping Cart Purchases and Loyalty items. 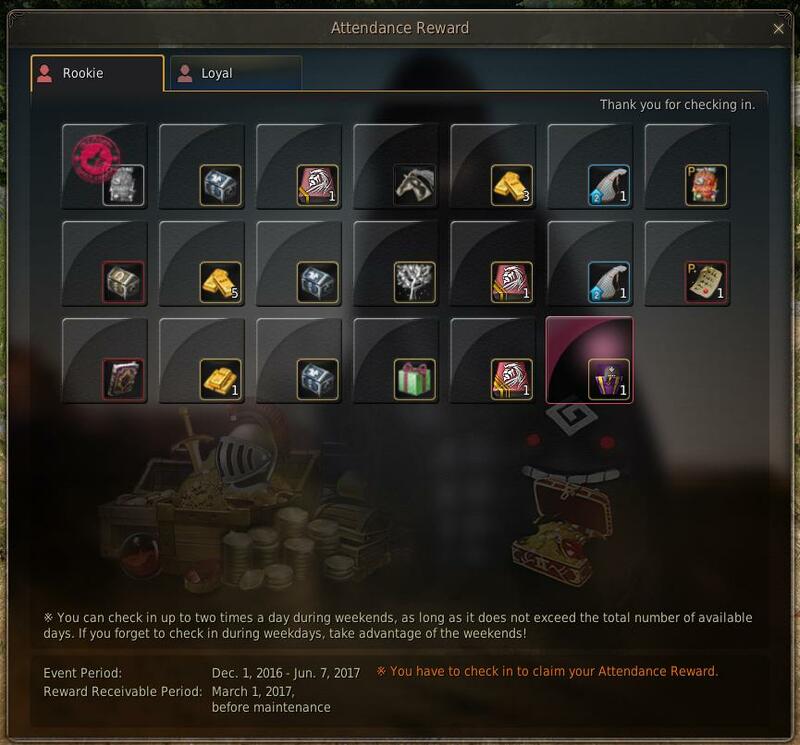 The attendance rewards for New and Returning players have been adjusted and the duration has been extended. 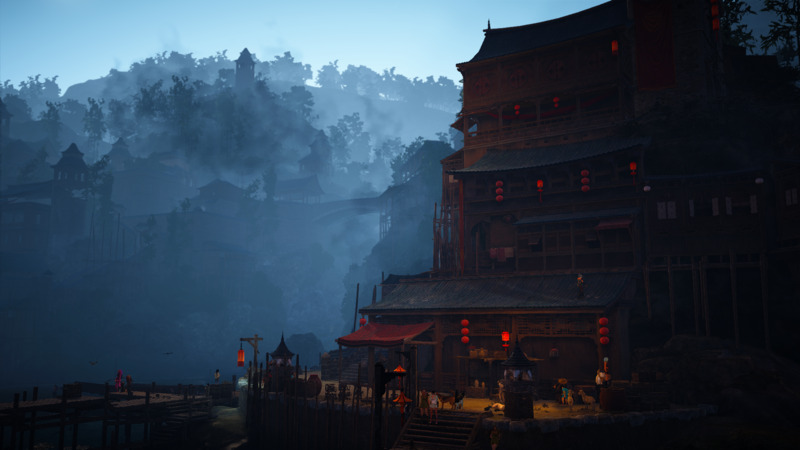 Our recent screenshot contest has ended and we're adding a new rotation of winners’ masterpieces to be included in the Black Desert Online game loading screens; check them out below! Ew, that event, is... so bad. This is all very underwhelming, especially the 1 year event "reward". Disappointed. And why not a special loot table on all world bosses for a week. One day? Really? Oh and I tried to use that coupon crap and it didn't work. I want my $60 back until you fix it! EDIT: MUCH MUCH BETTER THANK YOU! 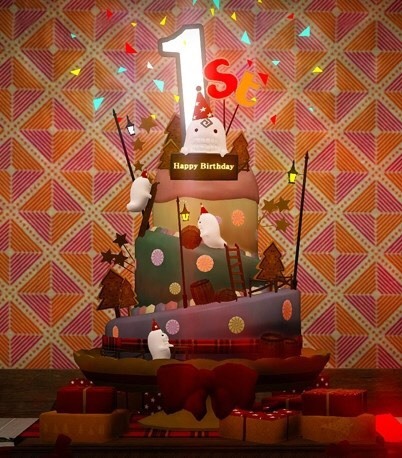 I'm usually one to defend Kakao, but a cake is a rather terrible "event" for your 1 year anniversary. Not everyone uses the cash shop and whilst 20% is a nice enough discount, there should be something more substantial for every player rather than just one piece of furniture. This just feels like your monthly events rather than celebrating one year of BDO. There should also be some sort of loyalty gift, perhaps 3 different tiers based on how many days you've played (100/200/300). 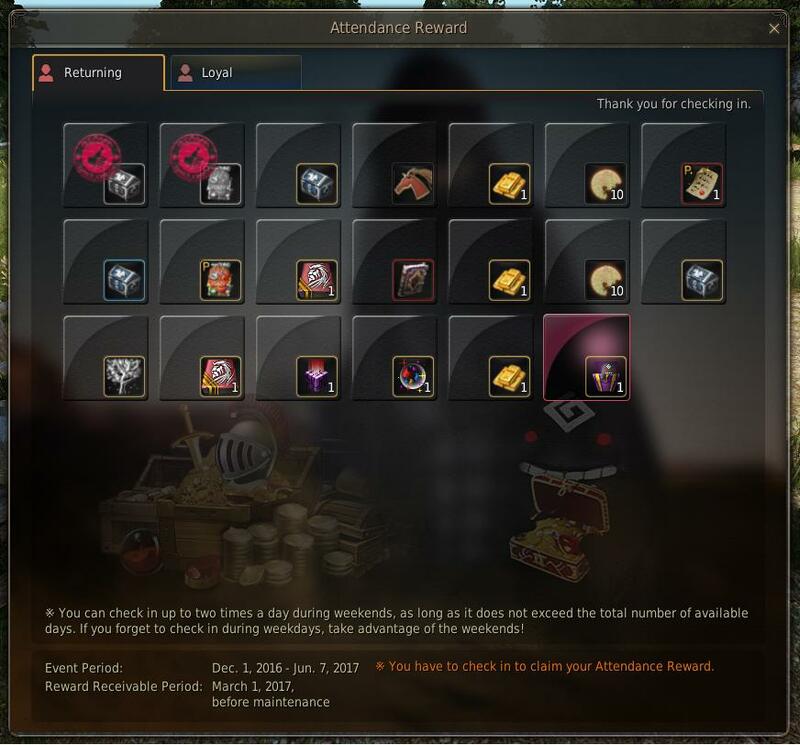 I'm loathe to compare other games to BDO, but there should also be a special hunting/gathering/fishing events that is specific to the anniversary, not just for dark knight. Is this some joke I am not getting? For one year we get a piece of furniture? Wowe glad i stuck around. Wow,so people that have played since beta get the same reward as a new player. Geez how thoughtful. You paid the furniture with teas and milks... Be grateful!!! I'm usually one to defend Kakao, but a cake is a rather terrible "event" for your 1 year anniversary. Not everyone uses the cash shop and whilst 20% is a nice enough discount, there should be something more substantial for every player rather than just one piece of furniture. This just feels like your monthly events rather than celebrating one year of BDO. Finally something I agree with you about. This is absolutely terrible for people who have been here the whole damn time, yet they keep enticing the returning/new players only to spit in their faces later. And it sounds like they're just extending the 'loyal' and new player login reward event, not providing anything new to, you know, loyal players. Can't wait to get my Roast Chicken from Field Boss Event. 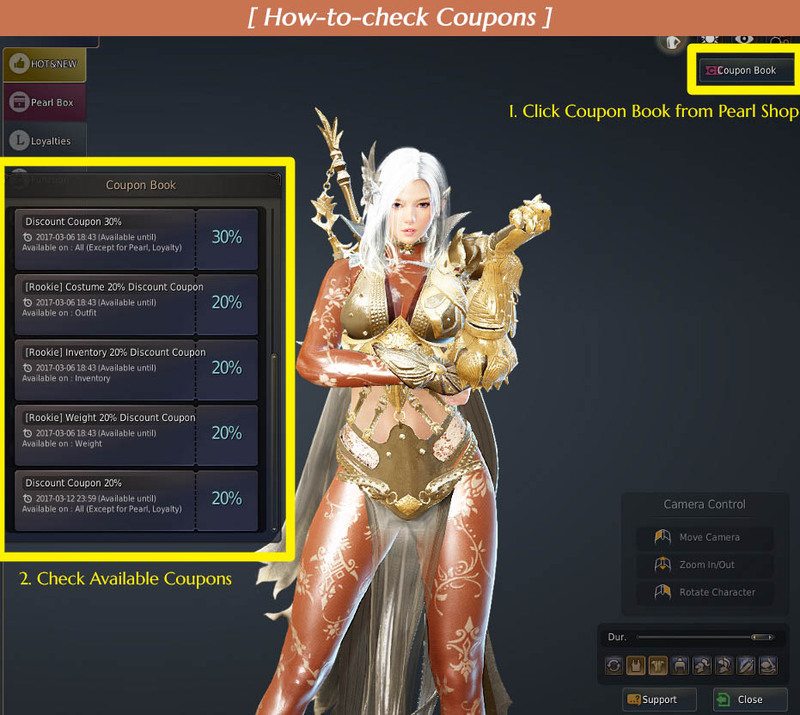 Thanks Kakao. OH, I get it- Its 'your' birthday so everyone has to give you a present in the form of cash to the cash shop. Q. What do our characters get when they are one year old? Should really consider doing stuff like this on weekends, especially for the North American audience, unless there is some chart i'm not seeing somewhere that shows that the majority of players have access to the game on Fridays rather than Saturdays or Sundays. I suppose it makes sense though, if staff doesn't work on the weekends like most of the working population so, yeah, that makes sense. Hm. They will remove it from your inventory 3 days later so remember to be quick using it. Is the discount coupon a one time use (1 purchase, several items in basket) or one item use?